The NDIS is a new way of providing supports to Australians between the ages of 0 – 65 years who are living with a disability or mental illness. The NDIS supports people to achieve goals, participate in the community and live a full and ordinary life. The National Disability Insurance Agency (NDIA) is responsible for implementing the NDIS, undertaking eligibility assessment and developing plans with people who apply for NDIS supports. 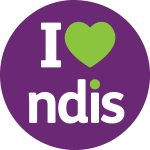 To talk with the NDIA about your circumstances or make an NDIS application contact 1800 800 110 between 8am and 11pm Monday to Friday. Free of charge translation, interpreter and other assistance is available.